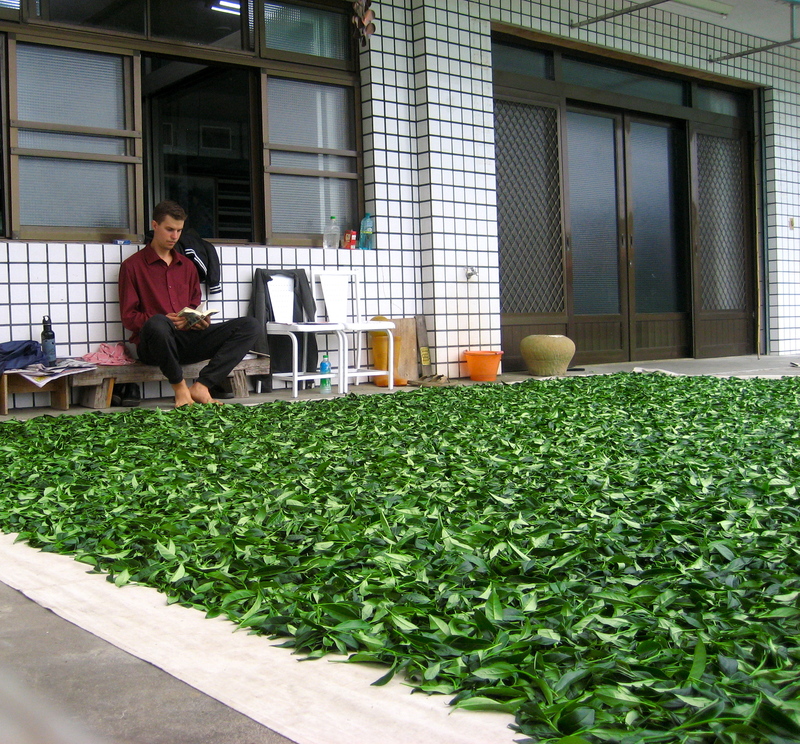 I’d like to emphasize the amount of work that goes into making Taiwan Oolong tea, so that we can appreciate why so many hold it in such high regards. Making tea is a tradition, an art, a craft — and an enduring one at that. I speak not from a journalists’ perspective, but from my own, as someone who took part in the enduring process and marveled at the work carried out by each tea maker. I say “each tea maker” because there are many more than just the ones who own a particular factory. Tea factories are massive and expensive and most tea makers (of which there are many in a tea village) can’t afford one, so they rent the ones already in place. 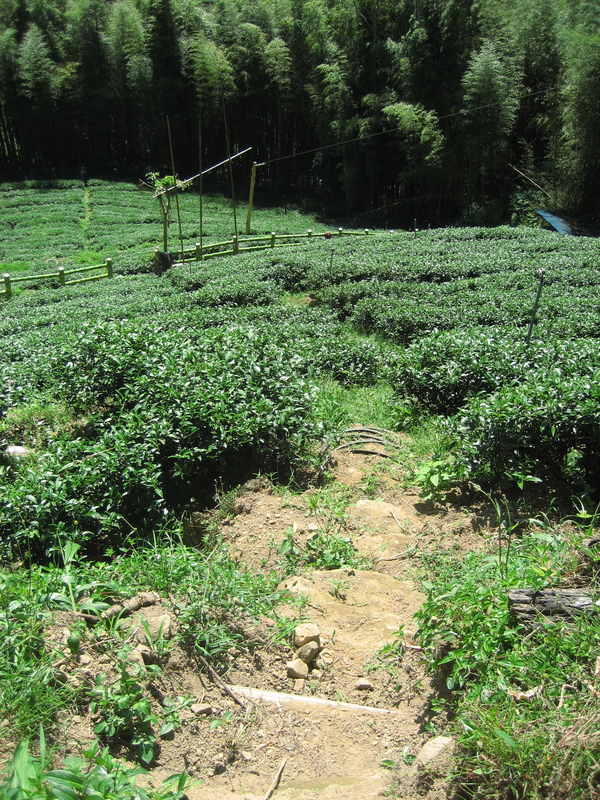 It’s a very interesting relationship between farmers, field workers, and tea makers. One day you’re helping make tea for one tea maker, and the next, he’s helping make tea for you. Sometimes two or three tea makers are using the same facility at the same time! Those are wild days to behold. I should also say that while there are many tea makers (just like there are many cabinet makers, for example) the title of tea master, a title that goes well beyond certification and one I don’t use leisurely, is reserved for the undistinguished few. Back to the point! During these intense and sometimes sacred times of harvest, there is a lot of raw material to be processed (into a commercial product). The tea might get to rest during times of withering – but the tea maker doesn’t. One must constantly monitor the weather, the humidity, the look, touch, and smell of the leaf, and know when to change to the next step accordingly. It’s all about withering and knowing when to move on to the next step. 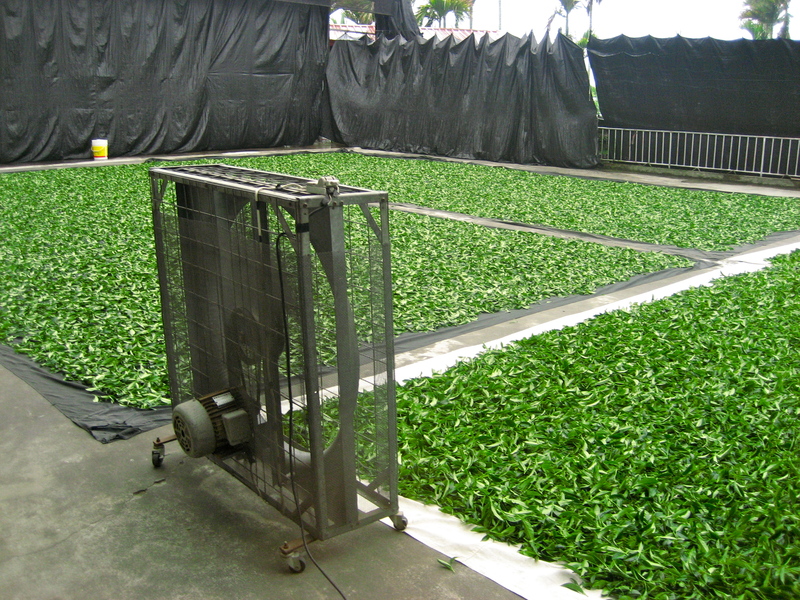 Withering, both outdoor and indoor, takes all day (about 12 – 15 hours), which requires constant monitoring. Next, tumbling and oxidation might only take a few hours or so. 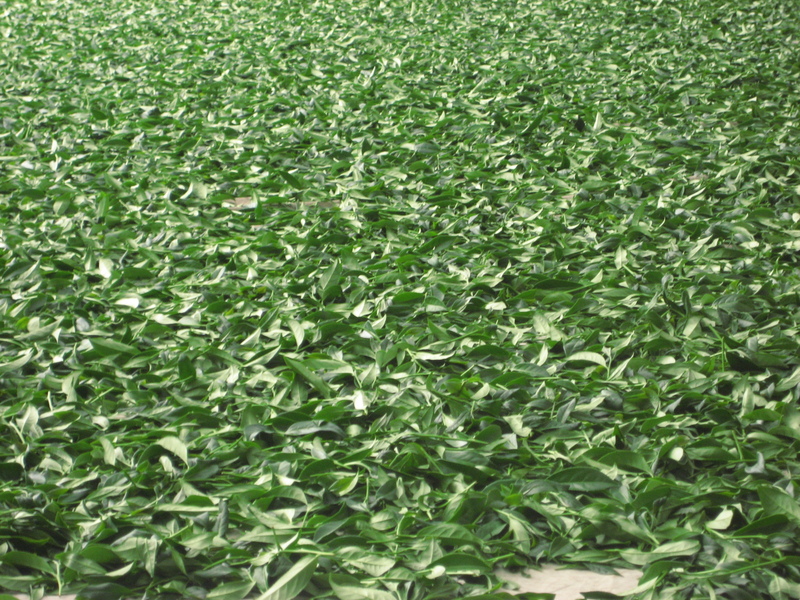 Also keep in mind that hundreds and hundreds of pounds of raw leaf are being handled, so the labor is taxing. 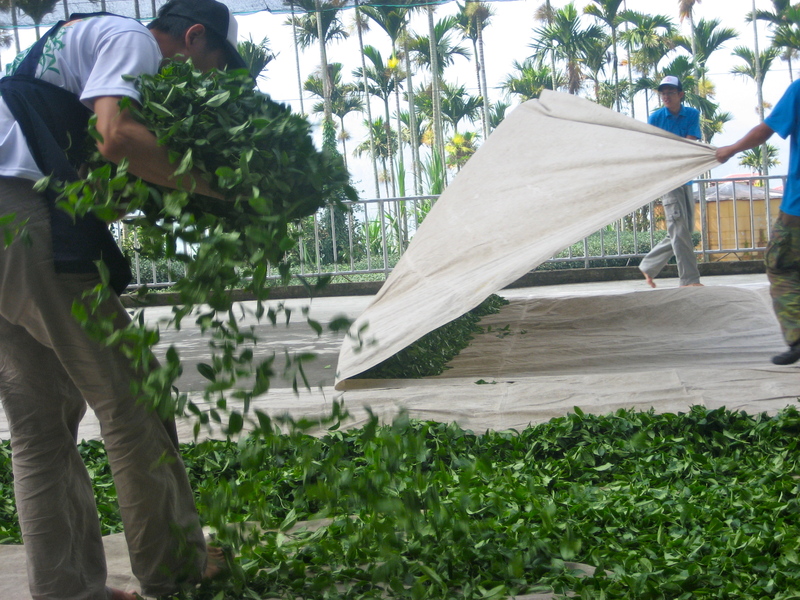 There is a lot of running around, spreading of leaves by hand, moving tea-covered tarps indoors, tumbling and re-spreading of leaves, and shuffling of tarps on the withering platform. As you can see, were already at 15 – 18 hours of work in just one day. 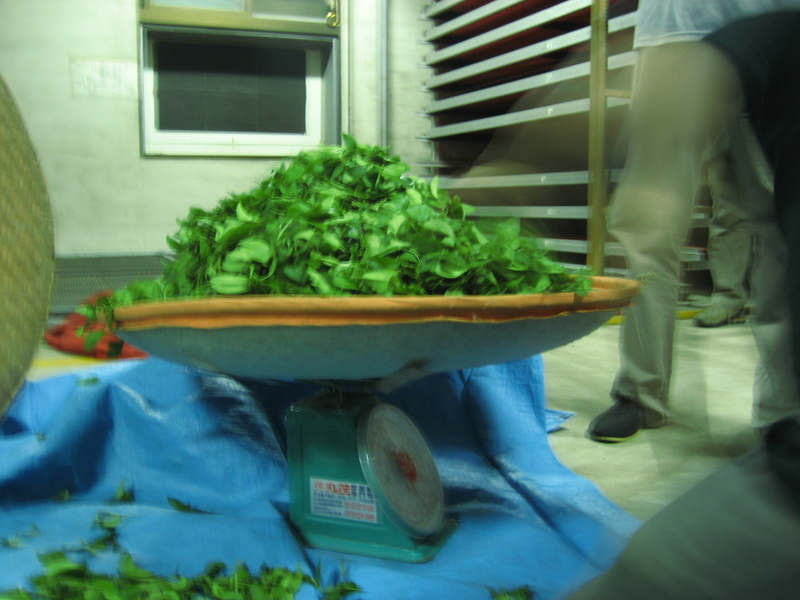 Depending on the volume of leaf, it’s usually about 1am – 3am at this point and we usually start around 8am. There’s lots more to go and this might go on for up to two weeks straight. At this point (around 2am-ish), the tea is passed on to a night worker, who kills the enzyme halting the oxidative process, and sends the “panned” leaf though a drier. 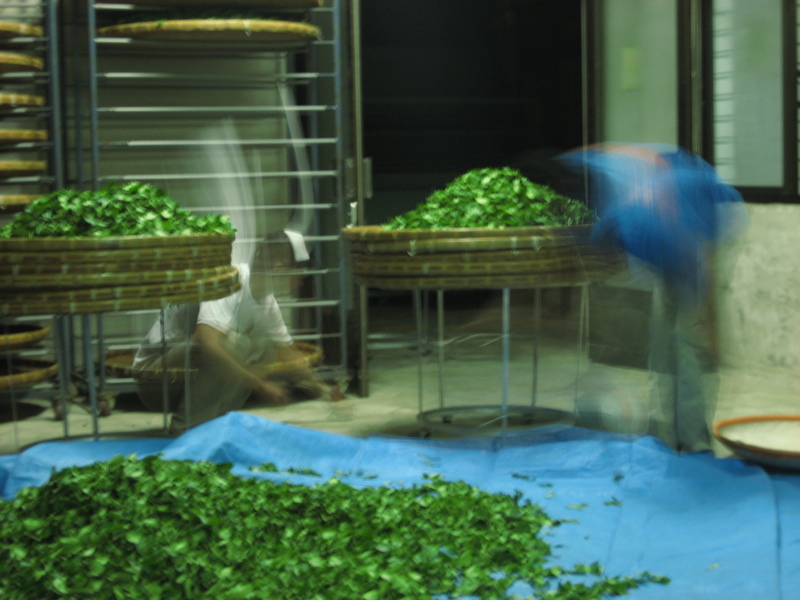 This takes all night/morning and the mid-processed tea lies in heaping piles by about 6am – 7am. The tea maker is up by this time to sample the tea, but more importantly to prepare for withering the next batches of freshly harvested leaves, which come in throughout the morning and afternoon. 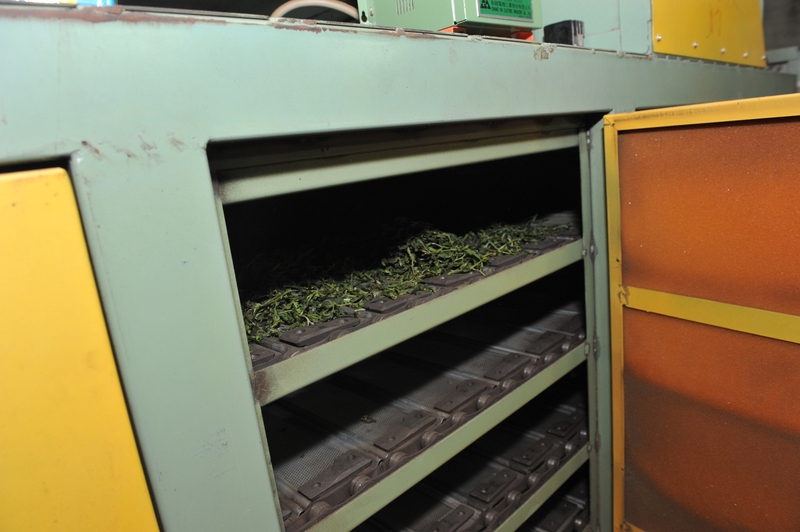 The mid-processed tea is once again passed on to daytime workers who shape the tea under high pressured rolling machines and lightly heated panning machines. 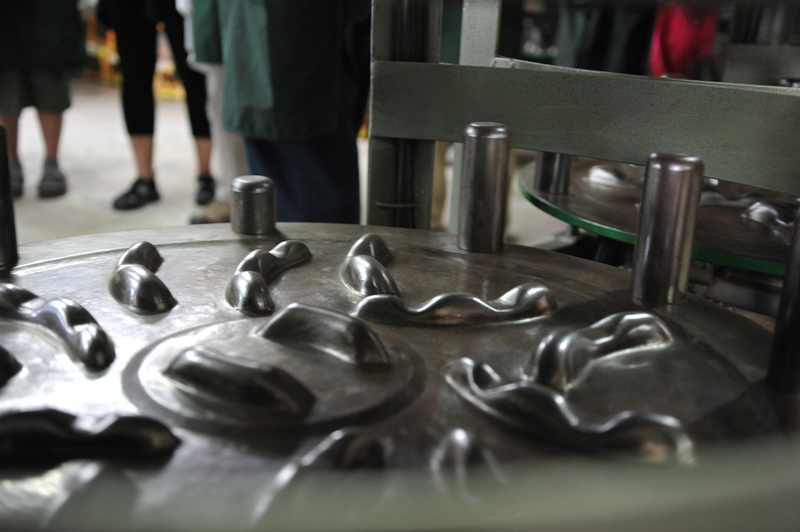 This shaping process, which transforms the tea from a spindly twig-like shape to a compact semi-ball shape, requires about 12 more hours. 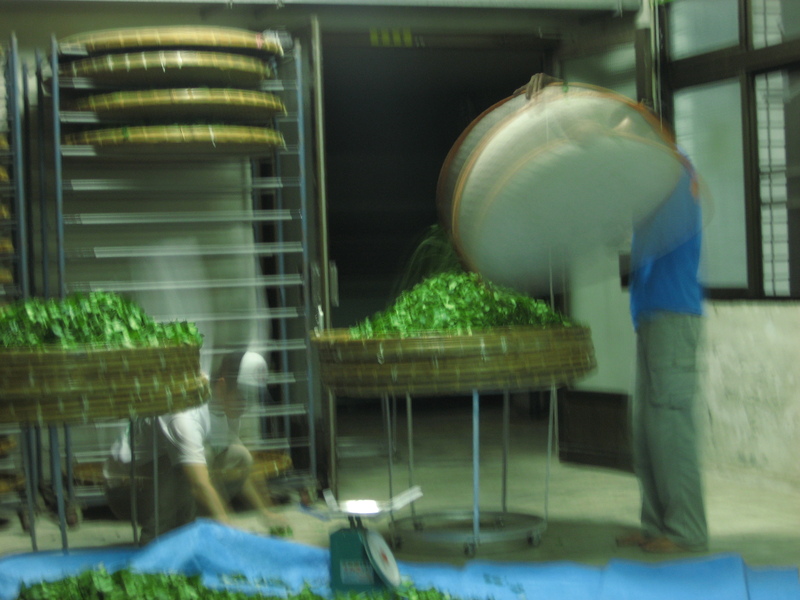 From here, the tightly rolled tea is stemmed by hand, dried again (and again!) and still has more work to be done, from grading, more stemming, and baking, to sampling, packing, and selling! It’s easily a 40 – 50 hour nonstop process. 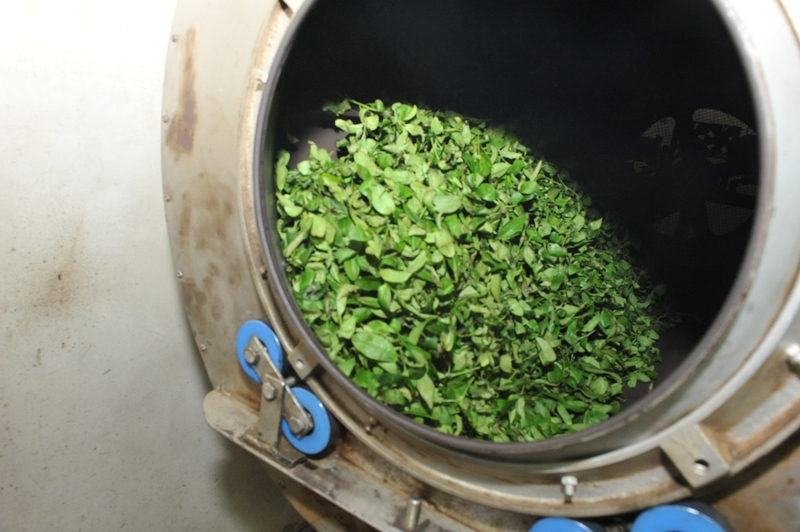 While the tea maker isn’t necessarily involved in every step of that two-day process, he is involved in the most crucial steps of each batch: withering and oxidation, and that’s always going to take at least 15 hours for as long as there is tea to be harvested. Considering these tea makers are human, who have basic needs like food, water, sleep, and most of whom have families to care for – this is an enduring tea saga from which they make a livelihood. And also know that I haven’t even mentioned the work conducted by the field workers, harvesting tea by hand, hour after hour, day after day, in the humid tropical weather of Taiwan. There’s good and practical reasons they wear the apparel they do, and it’s not to look festive and “Asian” for pictures in books. 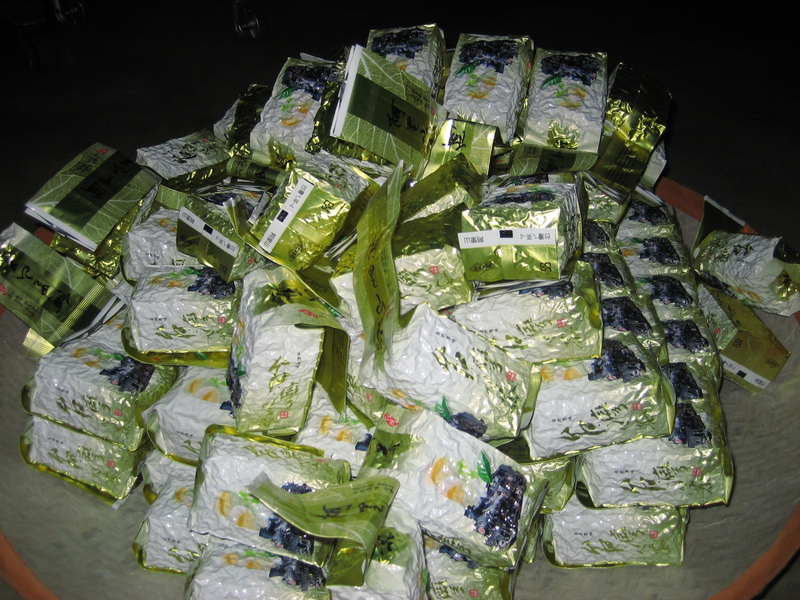 Nor have I included the task of collecting the tea from the pickers and transporting it to the factory — not an easy task. I have personally carried 78 pounds of raw leaf (large in volume) on my back, for about 10 minutes, down a hill-side to the car for transport — twice in one day. Often it’s much easier, but sometimes even harder. 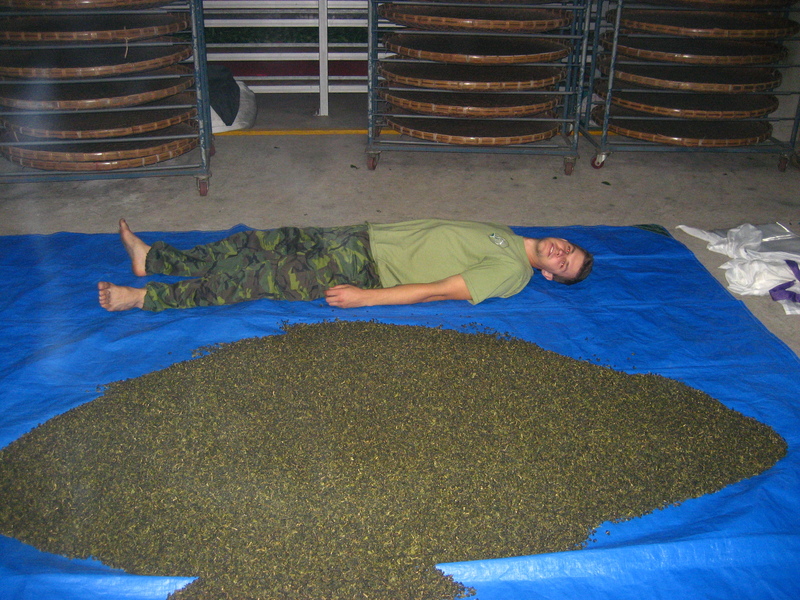 All physical and mental reserves are exhausted by the end of the harvest, and most tea makers, in an often hilarious and always sleep-deprived state, wonder why the heck they’re doing this. Lying there, next to the bamboo tumbler at 3am, for the fourteenth day in a row, intoxicated on lack of sleep, wondering: why on earth are we doing this — and why is this crazy Canadian here, wearing Taiwan army pants? Of course, it doesn’t stop there; there is always cutting back to be done (a huge job considering the sheer size of tea crops), business to conduct, and lots of preparation for the next harvest! Keep in mind that I’m speaking for just one type of Oolong tea, of which there are hundreds and maybe thousands. 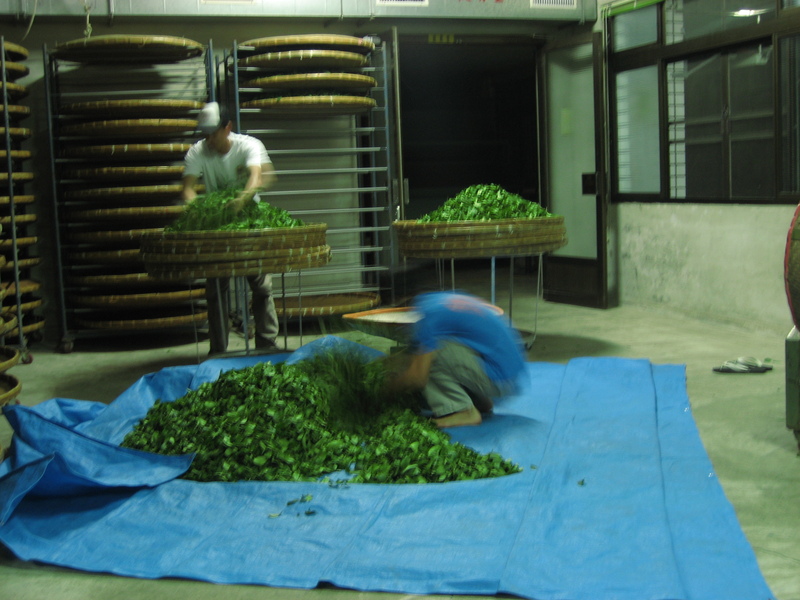 Oolong tea processing just so happens to be one of the most involved, so other teas definitely require less work. What I’m also currently learning is that a great deal of effort goes into preparing tea for competitions. For the last week, Mr. Wang has been baking and sampling his tea day after day to come up with just the right look, aroma, and taste to enter into the competition. It’s next Saturday and will my first tea competition! So if you’re ever wondering why tea “seems” so expensive, consider this blog entry (and the fact that mark-up in Western retail stores is monumental). Tea is actually really cheap considering the amount of work that goes into it. Not to mention it’s made on such a large scale and labour is less expensive here in Taiwan. $50/lb for tea is dirt cheap, depending on the quality, which is always the difficult part I suppose. Don’t compare 1lb of tea to 1lb of coffee; 1lb of tea might last you a year. So buy good tea and enjoy paying a fair price for it, knowing that regular hard working people are making it under taxing conditions for you to enjoy – and for them to make a living. I will close on this note: buy (and thus vote for) Organic tea. I’ll elaborate more on that in a future post. Well, my tea escapade continues! I’m going on three weeks here at the tea factory, but I’ll backtrack to the first two weeks for a brief summary of what life has been like in a tea village where I can’t speak the language, and where I stand out so much that locals actually take pictures of me. Here at the factory, there is a pervasive sense of community. The tea makers’ mother and grandmother live and offer their support here in the factory and out in the fields. There are four generations living in this factory. Both tea makers (Mr. and Mrs. Wang (pronounced more like Woughng, not Wahng, not Wong)) work directly with the laborers in the factory and field. They do everything the workers do, not to mention they feed them and care for them in other personal ways. It’s all quite seamless and natural, on a large scale, but not so large that Mr. and Mrs. Wang don’t take part in every small detail of labor, production, quality control, and distribution. Not to mention they have two young children to care for! I don’t know how they do it all – oh wait, yes I do – they work countless hours every day and night for weeks on end during the harvest. This is the life of a tea maker. While I do speak the universal language of Tea, my Taiwanese is limited to searching for words in my pocket phrasebook, which is actually in Mandarin. This has lead to a lot of funny scenarios as one might imagine. I had predicted a lot of handwaving and laughter – and it has been so. About five main words are used to communicate with me, my “name,” “one,” “yes,” “no,” and “hello.” That combined with hand gestures has been all I’ve really needed to get by. It might seem a little arrogant of someone to go to a country – for three months – where they don’t speak the language, but I go with the best of intentions and no one seems to mind, plus I’m studying the language while I’m here of course. Little did I know (because no one could tell me) that a documentary was scheduled for my 3rd day here – and apparently I was to be the highlight of the film. I felt pretty lucky, but the film director told me that she was the lucky one to have such an interesting story to cover. 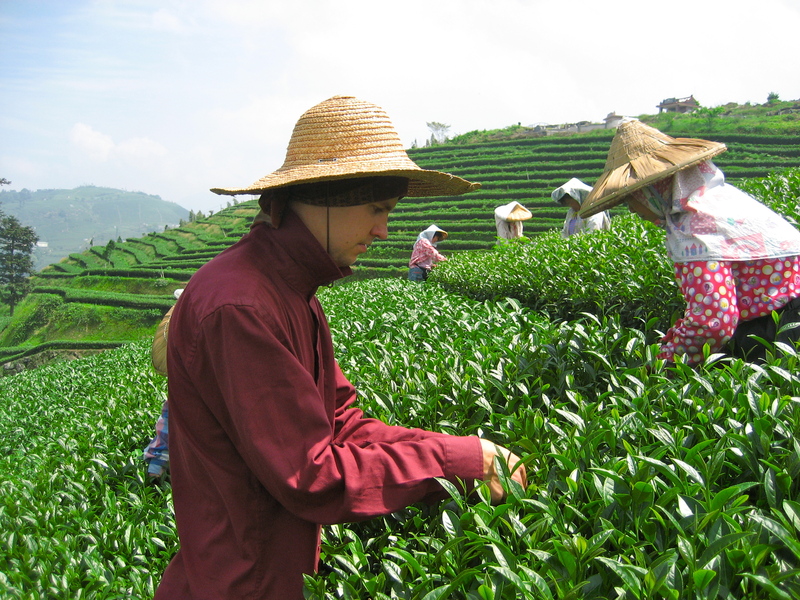 Thinking back, documentaries and books were the only mediums through which I knew anything about tea and tea production, until I began tea farming in Hawaii and taking a tour to Taiwan in 2011. I’m not sure when the documentary will be finished, but I’ll be sure to post it here when it is. I put a question mark after “pictures” because usually when foreigners travel to a foreign land, they’re the ones taking pictures. In my case, however, it’s the locals taking pictures of the foreign white guy working in a tea factory on the mountainside of Taiwan. It’s quite humorous; some people just can’t believe it. Actually, I could hardly believe it in the beginning either; the experience was just so over the top it hadn’t really sunk in during the first two weeks. One theme that became prominent in my first two weeks was that tea is livelihood for so many people, particularly in a tea village. When you grow up here, you’re sure to be involved in the tea industry in one way or another, which is why so many people find it strange that I would come here to experience that livelihood. I too would think it strange of someone to travel halfway across the world to volunteer in an apple orchard or a wine vineyard in the Okanagan. We have this fantasy image of farming, harvesting, and making tea, but it’s not nearly as glamorous as it’s made out to be, unless you choose to adopt the perception of glamour even in its rouged-ness. It’s not all green rolling gardens, spring harvests, and fantasy mountains in far off Asia, although those images are real. I myself am guilty of selling and perpetuating that incomplete and ideal tea image because until now, I had not experienced what tea life was really like – and I still have much more to learn. 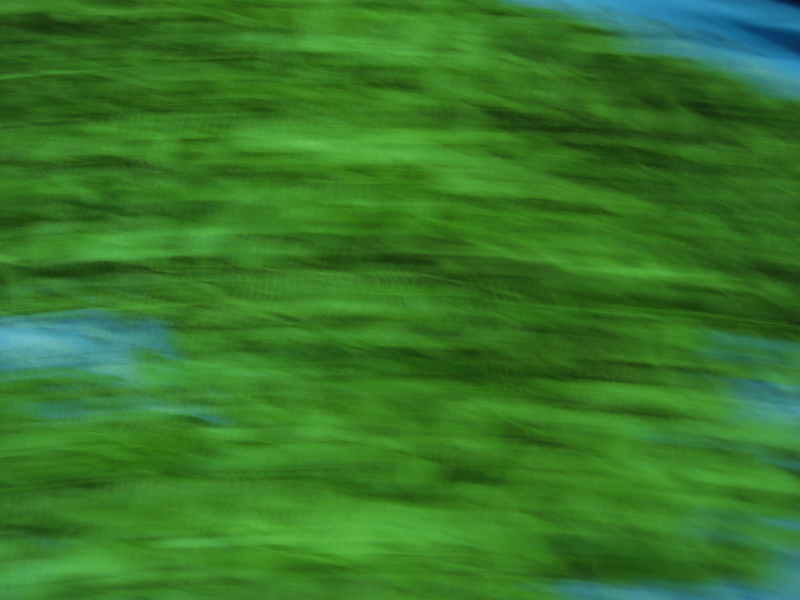 While I’m sure everyone involved in the tea making process is happy on some scale that this infusion can offer a spiritual and relaxing experience to so many around the world, I think more prominently they’re just like you and I, trying to make ends meet and pay the bills through means of work. (that’s a lie; I don’t pay any bills). Anyway, don’t get me wrong; harvest time can be very sacred and making tea is an ancient tradition and a beautiful art with a rich and cultural history, but it’s also a commercial product at the end of the day, grown unnaturally in massive monocultures to meet the market demand and fast pace of our current times. I’ll elaborate more on that in a future post. In my next entry, though, I’ll be elaborating on what it takes, physically and mentally, to make Taiwan Oolong Tea during a major harvest. It’s an amazing process and there are many facets involved that we don’t often hear about in the West. 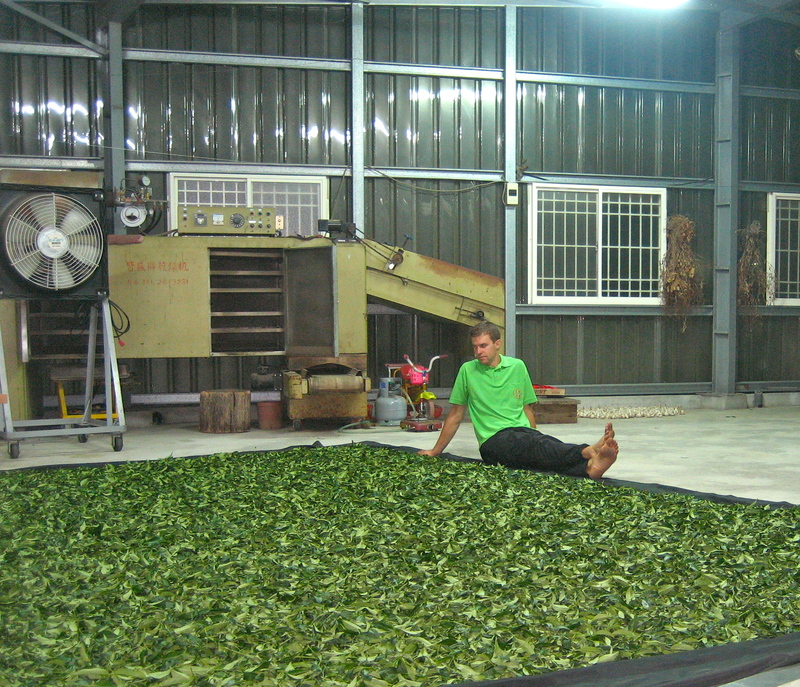 It’s 4am right now, and we just finished withering and tumbling the last of the raw tea material for the day. It’s oxidizing and waiting for the next step – but I’m going to bed. My bedroom lies next to the baking room and adjacent the withering, tumbling, and oxidizing room. One can only imagine the layers of aroma. Yes, I live in a tea factory – it’s difficult yet rewarding work, and it’s a good life, but not for everyone. For me, if money were of no concern, and I had all the time in the world, this is what I would want to be doing right now. 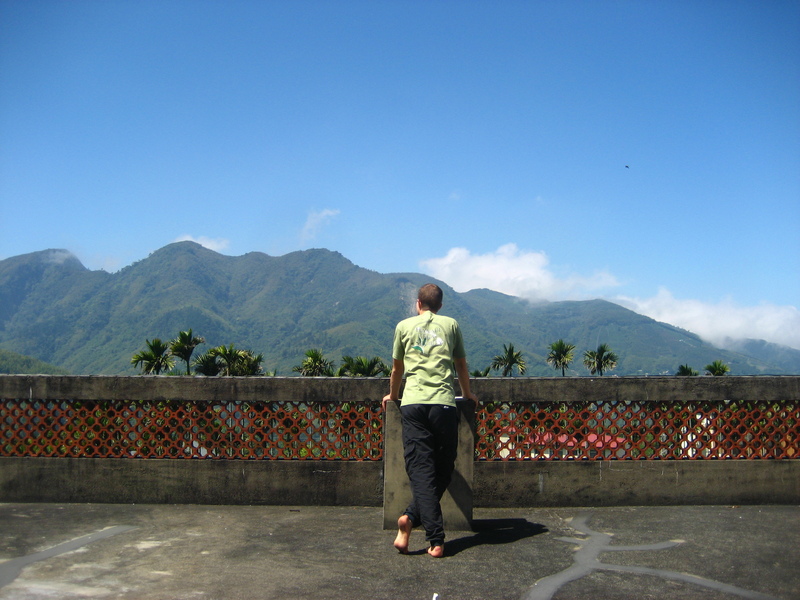 Anyway, I’m at roughly 3300ft elevation in the small tea village, Taiwan. Here I have dedicated myself to the laborious task of working in a tea factory and out in the fields – and let me tell you, it’s backbreaking, nail grinding, and finger callusing work. I’ve been here for one week now, spending day and night – literally – helping with the various steps of Oolong tea processing. I’ve seen thousands of pounds of raw leaf move through this factory, from the field to the vacuum-sealed bag, and every step in between. It’s been a real blessing that I be accepted to volunteer here. In just one week, I have volumes of insights and stories to share (and some to withhold). It would seem we are sold an ideal image of tea in the west, but from my intimate experience in this one small tea village, I would like to portray a much more realistic and raw picture, one that is less fantastical as we see it in books and documentaries, but one that nonetheless portrays why Tea is a Beautiful and Spiritual Art. I’ll be posting new updates slowly for a number of reasons; it will be worth it to address certain facets of tea life in great detail. 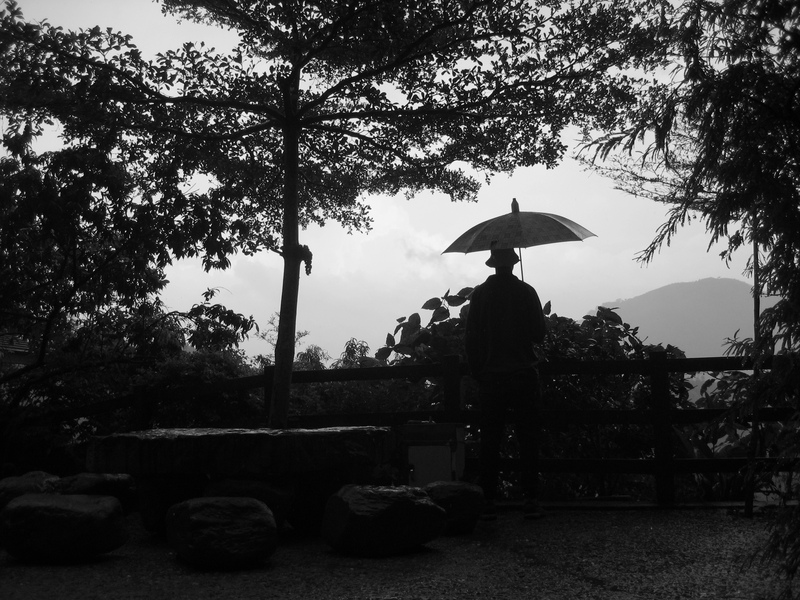 For now: know that when you are waking up (PST), we are here in the mountains of Taiwan, making tea.